A highly decorated airman who was selected to become a Presidential Advance Agent, Major Troy Gilbert would often travel to classified locations to meet Air Force One. On November 27, 2006, Gilbert, the pilot of an Air Force F-16C, was killed when he engaged in support of coalition ground combat operations that crashed northwest of Baghdad, Iraq. Reports say the crash killed him instantly. However, al-Qaeda insurgents took Gilbert’s body before U.S. forces were able to get to the scene. On October 3, 2016 Major Gilbert’s remains were returned to the U.S. and his family. 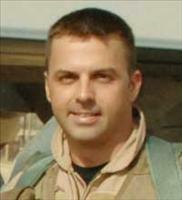 The 34-year-old based out of Luke AFB in Arizona during his final deployment, Gilbert was a 1993 graduate of Texas Tech. After training with the Air Force, which led him to becoming a pilot instructor, he earned its highest ranking honor, the Executive Flying Officer. Gilbert was posthumously awarded the Distinguished Flying Cross with honors. His remains are buried at Arlington National Cemetery along with the remains originally recovered in 2006 and 2012. Gilbert is survived by his wife, Ginger, and their five children.